About us - Rowe Sales & Service Inc.
Rowe Sales & Services, Inc. is a Manufacturer's Representative for machine building components and an Industrial Distributor for assembly related equipment. Operating continuously since 1958 (incorporated 1971) and spanning three generations, we provide technical assistance, products, and services to local manufacturers in all markets. 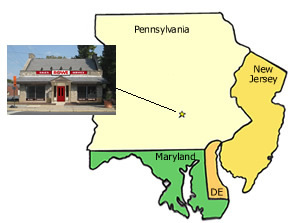 Our sales territory is Eastern Pennsylvania , New Jersey , Maryland and Delaware. We primarily offer U.S. manufactured products of high quality to meet the rigors of a production environment. Over the years the Rowe Sales & Services, Inc. sales team has visited thousands of manufacturing facilities seeing first hand the many challenges which face manufacturers. Our outlook for U.S. manufacturing remains very optimistic due to the diversity and resourcefulness of local manufacturers. For assembly areas – Rowe provides an impressive array of power tools for production lines and work cells. This includes electric DC brushless tools, pneumatic tools, pulse tools, cordless tools, workarms, automatic screwfeeders, torque wrenches, presses, workstations, pneumatic controls, clamping and fixturing. Improving Ergonomics. This previously limited field is now widely recognized as a necessary element for designing lean manufacturing cells and work flow layouts in all manufacturing facilities. Rowe provides a full-line of height adjustable workbenches & pedestals, angle adjusting fixtures, soft-grip assembly tools, cycle start controls and various other related items which reduce injury claims and increase production. We are neither a machine shop nor a design house. Rather, we at Rowe Sales & Services, Inc. typically work with engineers, fabricators and designers to develop a feasible concept . . . then provide the necessary components for the project. Beyond that, our factory trained service department remains current on service issues and repair techniques. We know our products both inside and out. It is this knowledge that differentiates our company from others and it is one of the reasons that we can boast of our customer loyalty. Please contact us when preparing for your next project. Rowe Sales & Services, Inc.